Thank you from the bottom of my heart for all of the compassion and support you have shown me and my beloved "Simon". I received his two hearts today and they were packaged beautifully. I also appreciate the photo cards you sent and the card reading "When someone you love becomes a memory, the memory becomes a treasure". And these two hearts are treasured deeply. As my friend and I looked at the hearts we cried and cried. The artist created a beautiful work of art. The way Simon's ashes were handled and the end result makes me feel as if you knew & loved him also. Thank you very much. Small Friendship Ball is approximately 3 ½” in diameter. The cremated ash can be added to the outside of the small Friendship Ball giving it a snow-like appearance, or it can be incorporated in the glass for a more subtle representation. 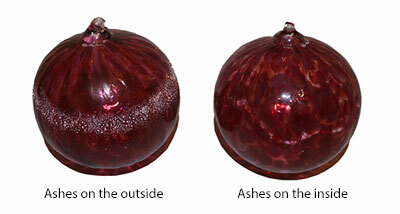 The cremated ash can be added to the outside of the small Friendship Ball giving it a snow-like appearance, or it can be incorporated in the glass for a more subtle representation.